I'm often asked (sometimes quite angrily) at meetings, conferences and forums discussing digital copyright protection "how the hell are we [the rights holders] supposed to compete with free?" The answer lies in audience. Don't believe me? 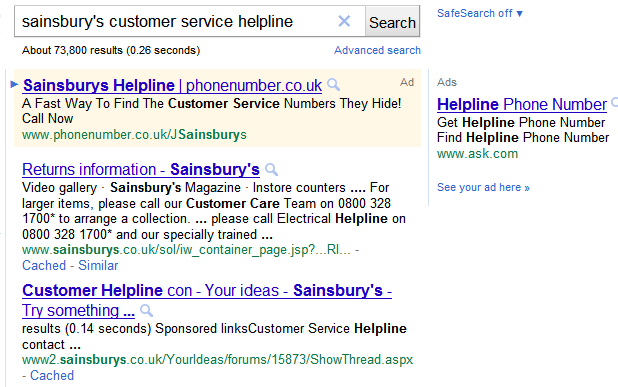 I've used the Google search: Sainsbury's Customer Service Helpline for well over a year as an example. For well over a year now there's been at least one unofficial operator attempting to skim off this free transaction. 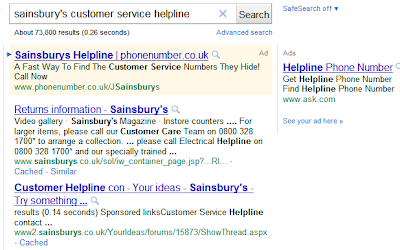 The paid-for result (shown above) is for a service which costs £1.53 per call from a BT landline, and it isn't even a Sainsbury's helpline. It's a service that provides the freephone number you get if you click the second link down the page (the first natural search result). 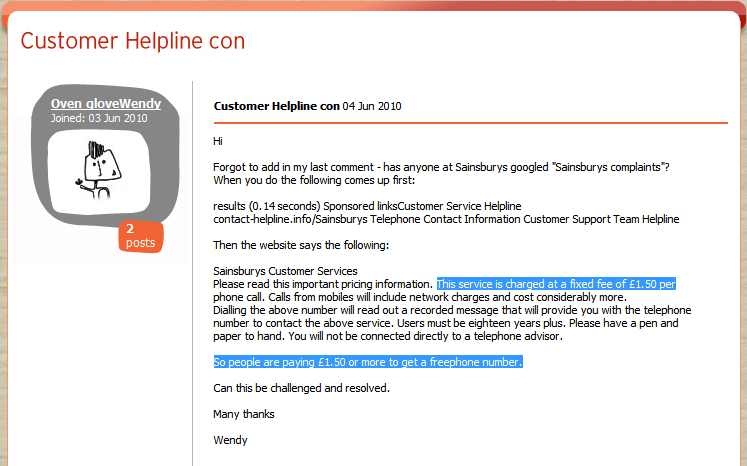 Incidentally, the 2nd natural search result is for a Sainsbury's customer forum topic discussing the "Customer Helpline Con", dated July 2010. "The information provided is also available free of charge from other sources on the internet"
So, is this paid-for service profitable? Is it competing with free? I can't say with absolute certainty, but by the fact this type of operation has been going on for well over a year indicates it is profitable, or they simply could not afford to do it. The company operating the service will be paying for the advert, either every time someone clicks (PPC - priced per click-[through]), or a fixed fee for a number of impressions of the advert. If PPC, a number of people will click on the link without realising a free alternative exists; and so whatever model the company chooses to advertise, there are fixed running costs which have to be met. So in conclusion, it's either profitable, or run for a laugh at cost by some benefactor.